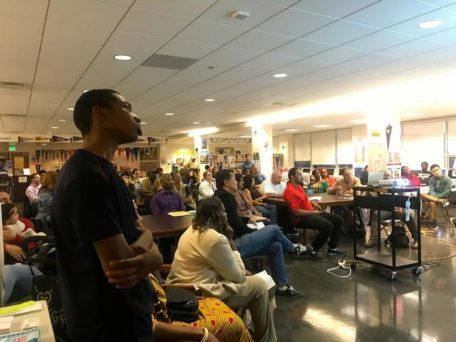 Ninth (9th) grade families were warmly welcomed to the Berkeley High School community at a reception and workshop on September 19. Together BHS Parent Outreach Staff and others in the Office of Family Engagement and Equity (OFEE), as well as several school administrators, shared resources that will support students to navigate and succeed at Berkeley High. Parents asked questions during the breakout session in Spanish. While all are welcome, African American, Latino and socio-economically disadvantaged families, in particular, are invited to this annual event that aims to personalize their experience by connecting them with key leaders at the school and the district, according to Ann Callegari, supervisor of the OFEE. The event opened with dinner and a welcome from BHS Parent Outreach Coordinators Irma Parker and Leticia Amezcua, and words of encouragement from Superintendent Donald Evans, school board director Beatriz Leyva-Cutler, principal Erin Schweng and Callegari before families split into English and Spanish sessions to learn about the support systems available to students at the school, from after-school programs and counseling to student clubs and scholarships. Schweng said that 9th grade matters because it is the critical period when students figure out their friends and adult advocates at the school, and Berkeley High School’s goal is to increase the percentage of students who agree that there is an adult on campus who knows them well to 100%. According to Dr. Evans, the event’s attendance has tripled since it first started three years ago. Parents and students learned about resources at Berkeley High School. In the break-out sessions, the academic support coordinator, dean of students, and BHS staff members from the college awareness program and on-campus intervention team each shared strategies for how parents can help their students navigate through the requirements for college and be a role model for students to develop positive learning habits. The staff hope that this gathering is the beginning of an ongoing supportive relationship with the families. 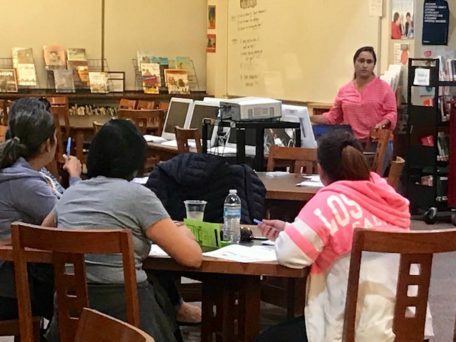 Families are always welcome to visit the Parent Resources Center, located just outside the school library at Berkeley High School, if they would like to learn more about resources and services.